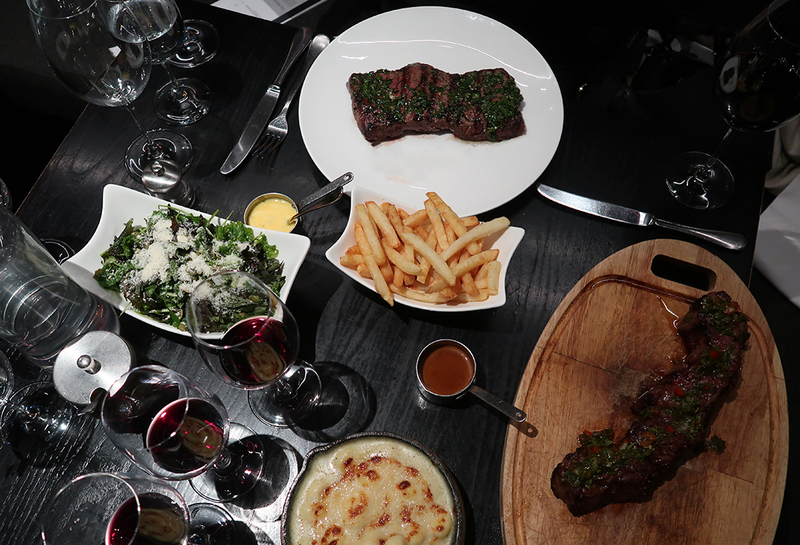 Any visitor to London looking for good grass-fed steak and excellent Argentinian wines won’t do better than Gaucho. The group of steakhouses have existed for some years now and I’m pretty sure that original Gaucho Piccadilly was the first ‘grown-up’ date restaurant I went to. I can remember cowhide on the walls and elegant leather chairs, together with sparkling chandeliers and an almost-but-not-quite outrageous decor. It’s evolved a little over the years. The decor is a little subtler, though still chic and glamorous. And, the service when we visited was close to faultless. 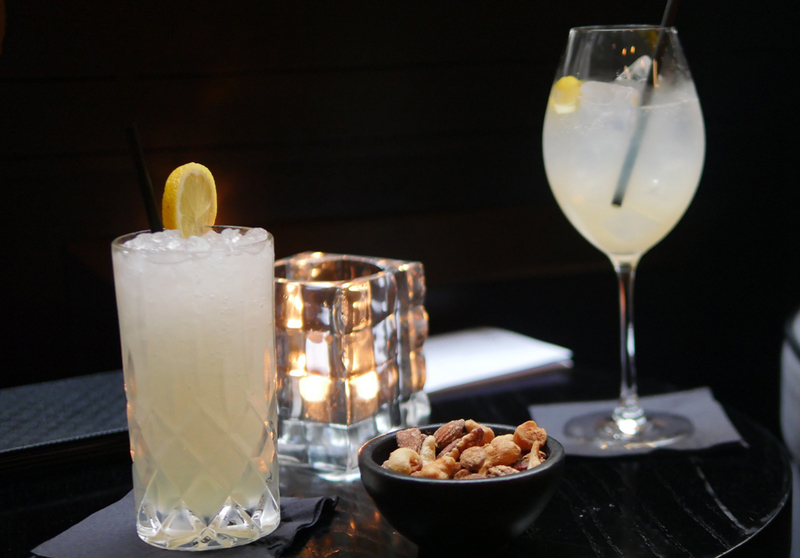 A drink at the bar is a pleasant way to start the evening. 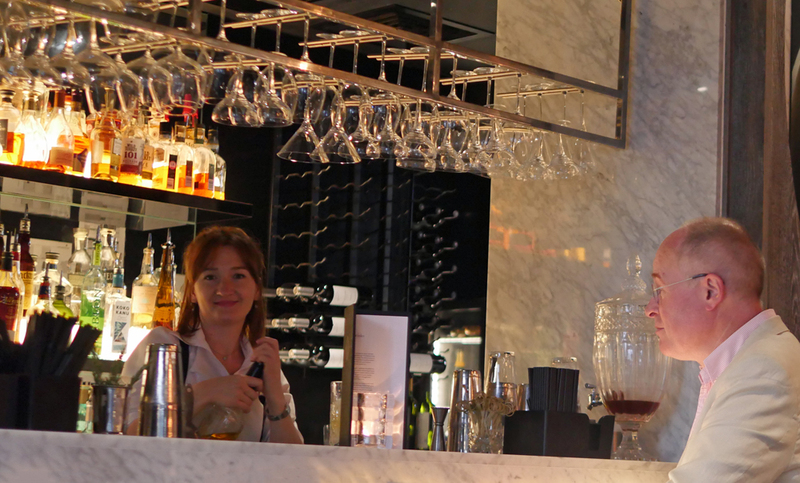 Gaucho has an excellent range of cocktails and an extensive wine list. 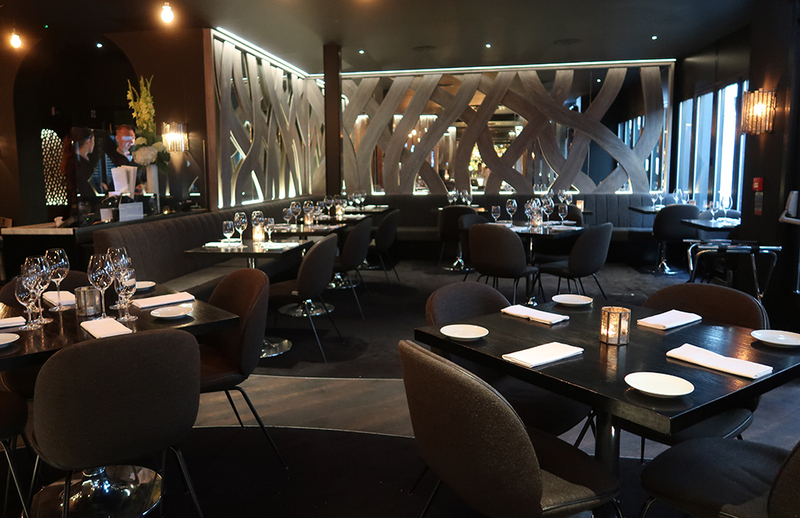 Then move through to the restaurant – there’s an outdoor heated terrace if you want to eat al-fresco or a comfortable and luxurious space indoors. As the appropriately named Swallow Street is a car-free side passage, it’s quiet and pleasant outside, though we decided to take advantage of the spacious restaurant on what was one of the first autumnal days this year. The first thing I noticed since my last visit to Gaucho (actually to the Richmond branch) was that the service offering seems to have moved up a substantial notch. 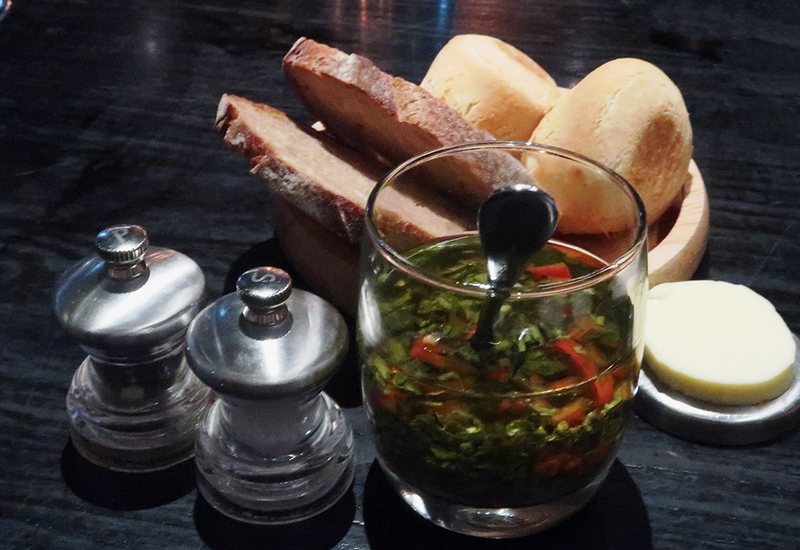 Gaucho staff have always, in my experience, been well trained and knowledgeable (there’s even a Gaucho academy). But, this has now moved on into the food and wine delivery. Our waiter appeared with a steak board, ready to explain each cut of steak to us before we picked our meal. And, the sommelier helped us choose wine by the glass for each course by bringing three or four bottles that he would recommend and allowing us to taste each one. A cynic might suggest that was because we were there to review, but we watched closely and saw every table throughout the evening given the same treatment. Of course, in a steakhouse, especially one where the steak is specially imported from Argentina and is grass fed on the vast Pampas, there’s really nothing else to order as a main course other than steak. There are options on the menu, but I’ve genuinely never tried any of them. We decided to try the two house special (as recommended to us by our waiter). 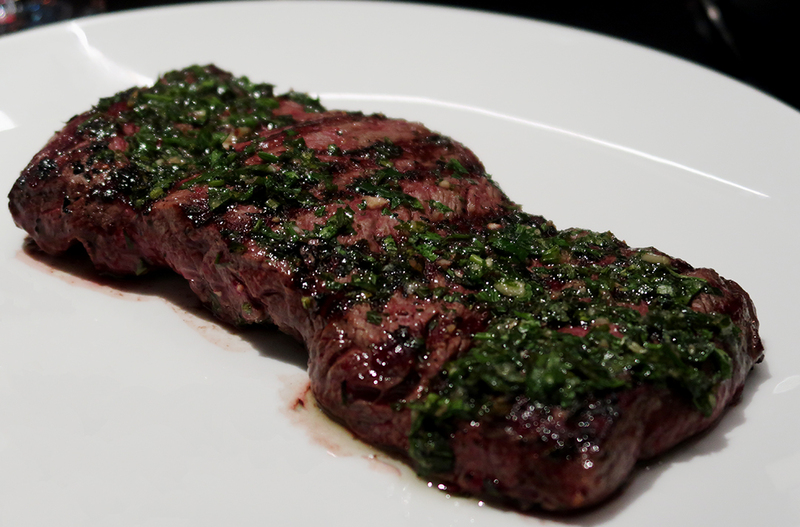 Churrasco de Lomo, a spiral cut of beef fillet, marinated in garlic, parsley and olive oil and Tira de Ancho, which is ribeye, also spiral cut but slow grilled with chimichurri. 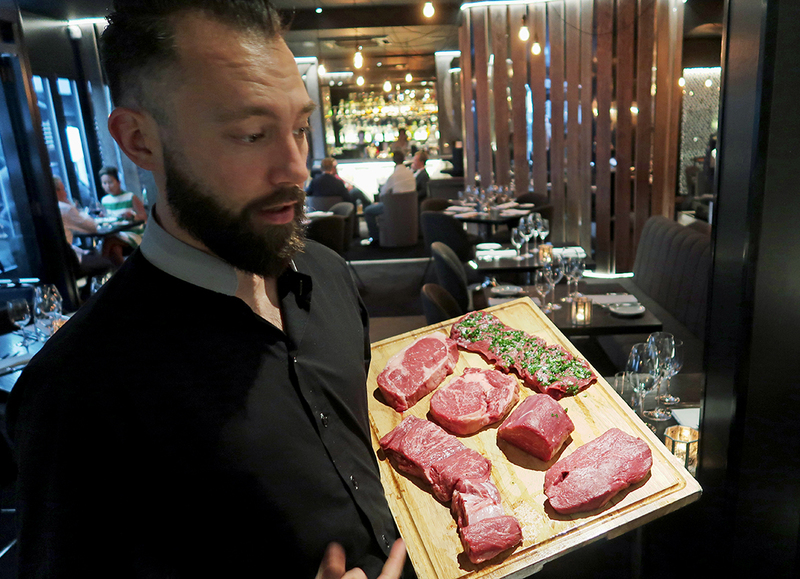 We generally ask the chef to prepare the steak as he sees fit when we order these kind of cuts. Ribeye, for example, is seldom served blue because it is marbled throughout and the steak really needs to be cooked to medium rare at least in order to melt the marbling for maximum flavour. We ordered side dishes too and Bearnaise sauce for me, Peppercorn for my companion. To start, we shared the seafood sampler and loved every mouthful. The salmon carpaccio was fresh and tender. Tuna ceviche, piled on an avocado base, was delicious. I couldn’t work out the flavours at all and my companion was bravely pushing the taste of soy. 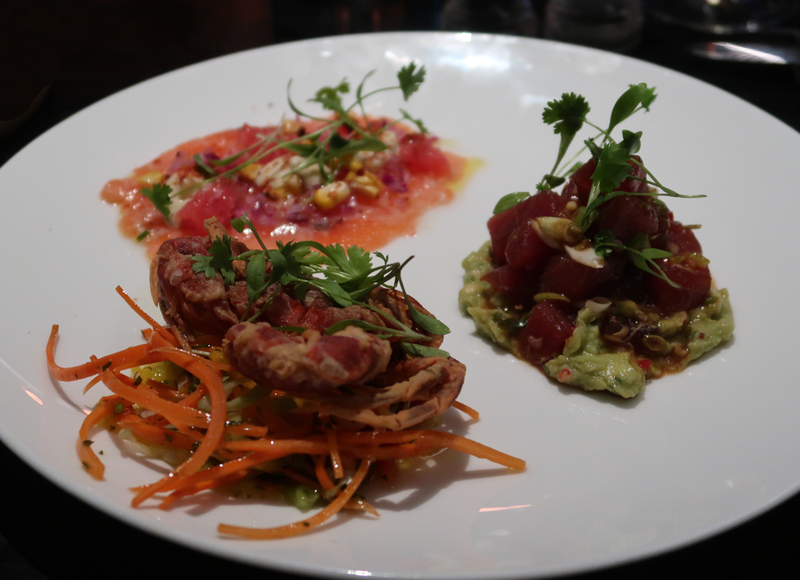 We asked and were told that it was made by marinading the chopped tuna for no more than 30 minutes in a soy, ginger, jalapeno and sesame based marinade and serving on a guacamole. 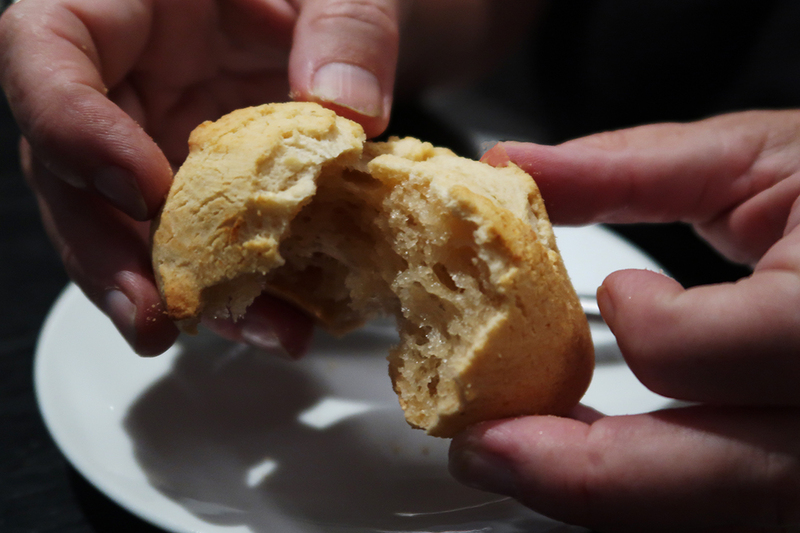 Delicious and oh so simple. 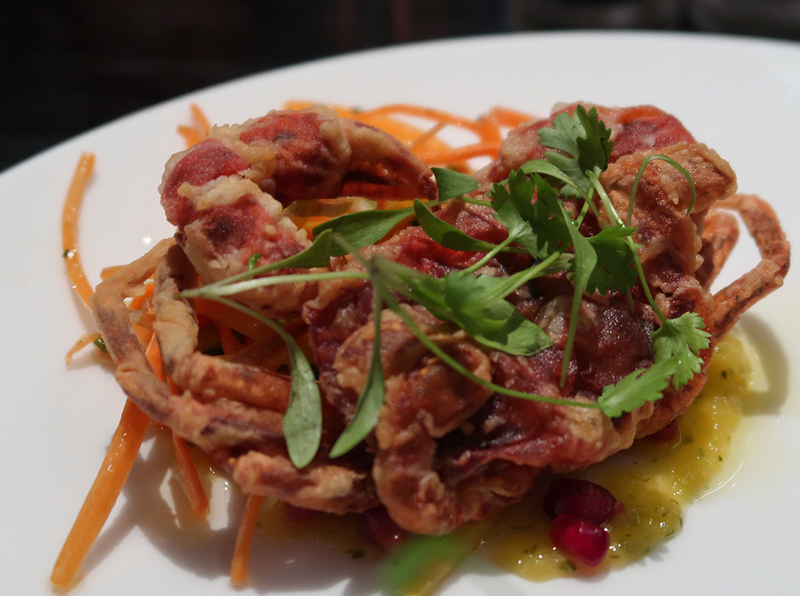 The soft shell crab and chimi slaw came with the lightest of tempura batters and was fresh and crunchy on the outside with a good proportion of meat. 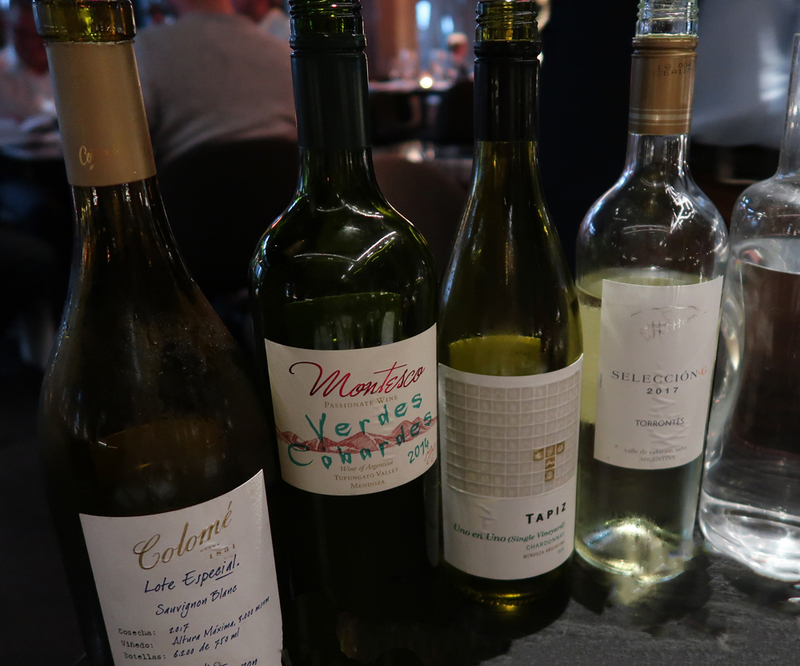 Our wine at Gaucho Piccadilly was chosen from a selection of whites. Chardonnay Uno en Uno Bodega Tapiz is specially produced for Gaucho and is a lovely, fresh white with grassy, lime notes. 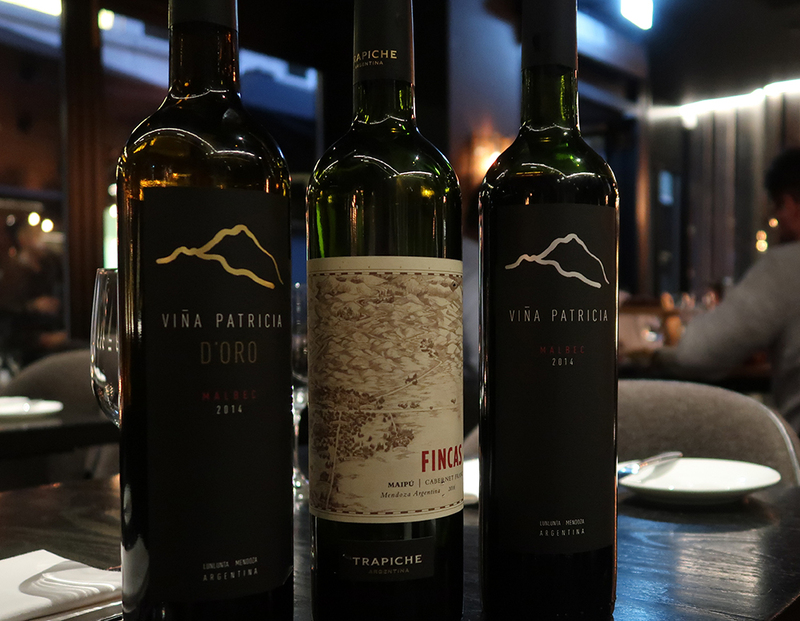 The Montesco Verdes Corbades 2014, is, I understand, a new addition to the Gaucho wine list which comes from the Tupungato Valley, a region at the foot of the Tupungato volcano, one of the highest peaks in Argentina. It was minerally and light and works well with rare steaks. We enjoyed tasting four different wines to select our favourite. For me, the downside of this kind of wine selection is that by the time I’ve tasted four wines I probably don’t really need any more to drink at all. But I managed admirably and went on to select my own wine for the steak. I’d ordered the Churrasco de Lomo, which I’d happily have again, though it was actually large enough to share. It was beautifully tender, perfectly rare and the marinade meant that there was no danger of the meat being tough or dry. My personal wine selection was the Cabernet Franc Fincas Bodega Trapiche, a classic black fruits wine that was not too heavy. My companion picked the Malbec d’Oro Viña Patricia which is the premium wine from Gaucho’s own Malbec vineyard in Lunlunta Mendoza. 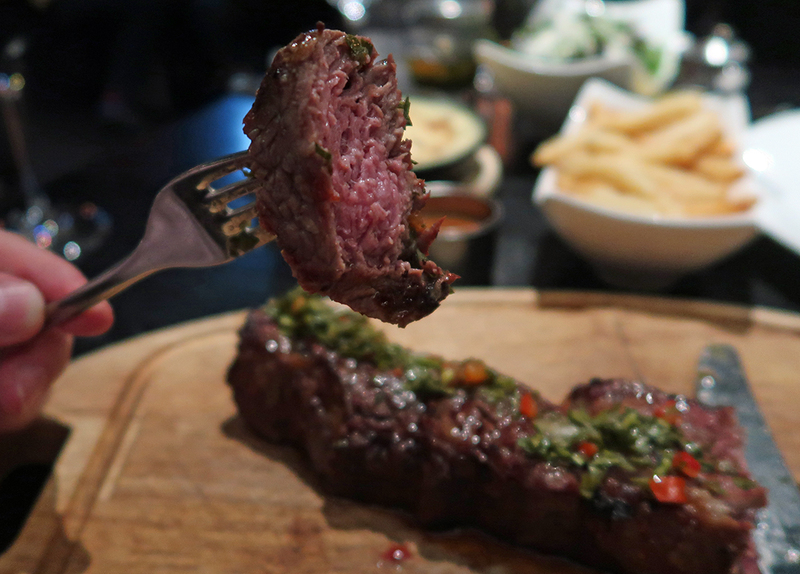 A soft, warm and fruity mouthful that helped cut through the richness of his Tira de Ancho, served medium rare. 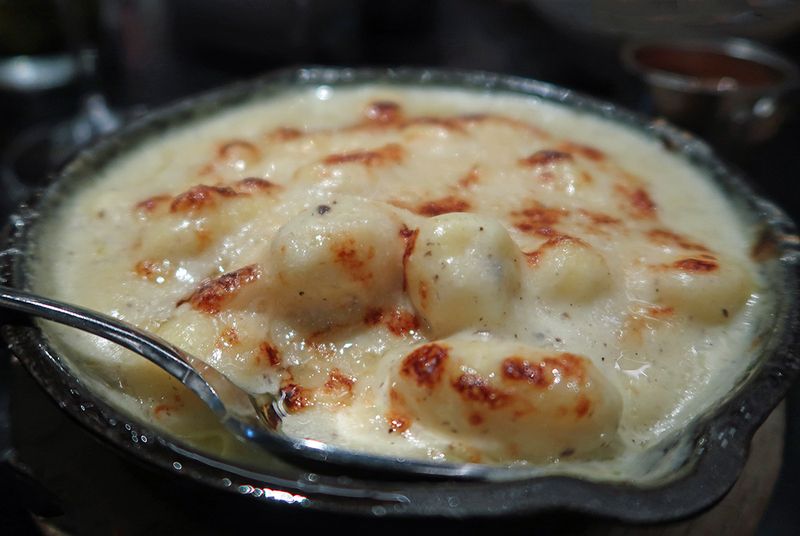 With our meat, we enjoyed an oven baked gnocchi with truffle sauce, a meal in itself. a large portion of fries and a rocket and parmesan salad. All beautifully prepared and presented, we seemed to have an overwhelming amount of food. 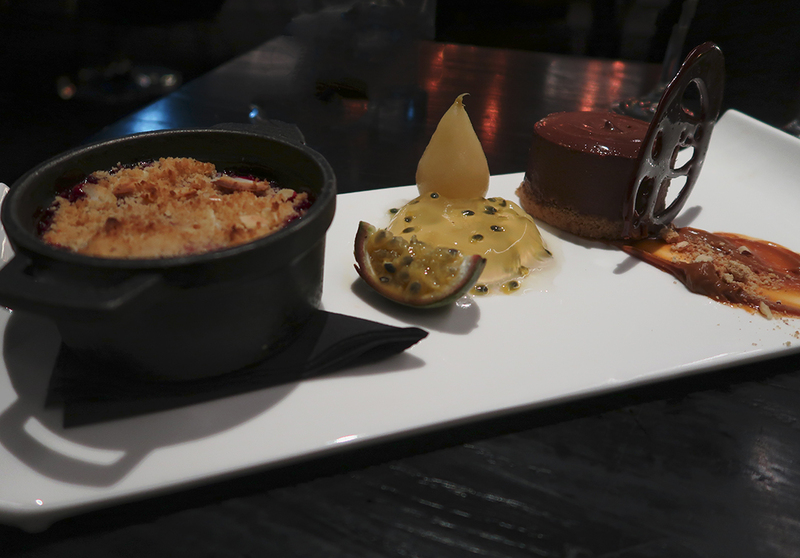 For the sake of the review, we went on to share the Gaucho dessert sampler, which, if you are craving a sweet ending to your meal is a remarkably light and refreshing option. I particularly enjoyed the light Chandon jelly and had I not already eaten too much I’m sure I’d have scoffed the delicious chocolate truffle torte. Once again we were offered three sweet dessert wines to pick from, though I seem to remember doing little more than sipping them to try. Coffee was an essential way to come back to earth after our feast. We staggered home happy and replete.